Fear or Love? | Indestructible Ideas! Relationships in and of themselves aren’t bad or good; what happens is that most people enter relationships unaware that they are looking to fill a need or lack in themselves. That lack could be a fear of feeling alone, the need to feel love or approval, a desire to make your parents happy, or just the habit of believing what society tells you what is right. If you aren’t aware of the reason why you are in a relationship it’s probably doomed, because it’s being formed to fulfill a need that you didn’t even know you had. We have to understand life will always have hurt. But every painful experience is a chance for growth, a chance for learning. Painful experiences are there to help you understand what you do and don’t want in your life. The pain that you felt from a breakup or loss is not what matters. The EXPERIENCE is what matters. Experiencing pain is just your body‘s and emotions‘ way to say “Hey something important happened.”What do you want to make your past about, pain or experience? You have to be open to love. In order to receive the love you want, you have to offer it first. If you place barriers and blockades around yourself because you are scared of being hurt then you aren’t receiving love. It’s a whole lot better when you take a chance. What is life if you don’t take chances, just another linear life with no substance? Closing yourself off is just bottling the pain back up inside. The pain stays and begins to sprout more pain. Don’t water the pain, flush it out. Let it go through love.If you hold a butterfly in your hand and refuse to let it go because you love it so and will miss it, it will eventually die. But if you free it and let it glide in the wind, it will live on. You will know you did a good thing by releasing it. You will enjoy its beauty in your memory forever. 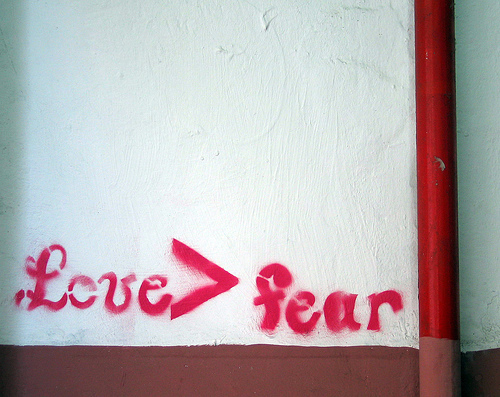 You have a choice between fear and love. What will you choose?